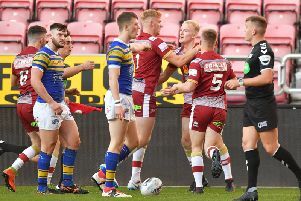 The match was thrown into doubt after the Centurions revealed they had only nine fit players and were told by the Rugby Football League they would be charged with misconduct if they failed to fulfil the fixture. The transfer deadline passed before the start of the Super 8s but the RFL has given both finalists permission to draft in new players after taking into account “exceptional circumstances”. Wigan academy players Sam Grant, James Barran, Liam Byrne and Ben Kilner have been loaned to Leigh for one week. All four, all aged 19, played in the Warriors’ Under-19s Grand Final victory last Friday and prop Byrne has been a travelling reserve for the first-team. St Helens have also loaned Chris Follin and Kevin Brown, while Castleford’s Jacques O’Neill has made the short-term move. Centurions coach Kieron Purtill said: “I’d like to thank Wigan Warriors, St Helens and Castleford Tigers for their tremendous assistance to our club at a time of need. “It is a testament to the work that they and other Super League clubs do with junior players that they produce so many quality Rugby League players. “As a club we have a very good relationship with Wigan, St Helens and Castleford among many others and down the line we would like to repay the gratitude we feel. “I have spoken to each of the seven players and each one is excited to be part of the preparation for playing in a big game on Sunday and earning a heritage number for a great rugby league club in Leigh Centurions. They can’t wait to get involved. “Not many players can say that they made their senior debut in a cup final but each of the lads will be able to re-count this to their grand children in 50 years’ time and hopefully for each of them it will be the start of a successful and enjoyable senior playing career. League legend Garry Schofield took to Twitter to offer his services and says he is waiting for Leigh to respond! An RFL statement said: “In response to a request by Leigh and Featherstone, and after consultation with the other Championship and League 1 clubs, the Rugby Football League has agreed to grant a dispensation to both clubs to register, on loan, additional players ahead of Sunday’s Championship Shield Final. “After taking into account all relevant factors, the board of the Rugby Football League believes that there are exceptional circumstances that justify this dispensation. 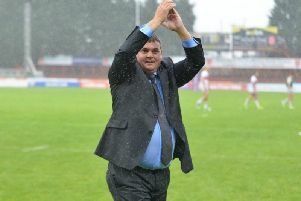 The Centurions were relegated from Super League at the end of last season and their failure to win their place back this time resulted in a major cost-cutting exercise after club owner Derek Beaumont served notice to end his funding. The club found new homes for a raft of players which left them with a reduced squad and, coupled with a glut of injuries, were unable to field any substitutes for last Sunday’s final league game at Dewsbury, which they lost 52-6. Leigh say their situation has now worsened and, of the nine definitely available for the Featherstone game, two are amateur players, although another three are facing fitness tests on Saturday. Leigh say they have yet to receive any offers of new investment and reveal that six of the players who have so far refused to accept new terms have not yet been paid their latest wages. The club also say that two players who did receive their payments in full have left the country.